2. Gucci leather pumps (buy similar here in black): This pair is another winner from DSW shoes. They were marked down significantly. I got them for $99.00 (was $495.00). The leather is so soft. They run a bit small so I had to sized up. This is my first pair of designer shoes. One complaint is that the bottom soles have no traction whatsoever. What’s why I haven’t worn them out yet. I probably won’t wear them until spring time. I’ve been leaning toward color pieces lately. I am very happy to find these lovely pumps. 3. 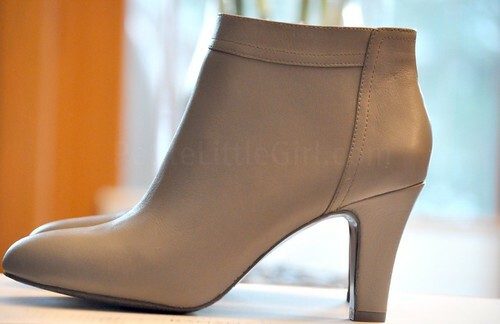 Banana Republic Samira Sleek Booties: I scored these booties last month. These booties were really a bargain! I've usually found online prices higher than in-store prices at BR and Gap. It is true in this case. I’ve been looking for a pair of booties lately and these met all my requirements (lower heels, leather, not black). They also run a bit narrow which is a plus. The leather is so soft and comfortable to wear. They also have great reviews online. I own several pairs of BR shoes. The quality is not bad at all. These booties are a great staple to my wardrobe. LOVE all of your recent purchases, I think all three of them are gorgeous...I can't decide if I like the first or the second pair most. Can't wait to see them in outfit posts! Whoa I love all of them! I think I like the Gucci ones the best! I have to make sure to visit DSW when I'm in the US next time! Completely in love with your Coach rainboots and Gucci heels!!! What a fantastic find! Does that mean I need to go to DSW tomorrow? lol! The traction problem can be easily solved by using safe step sole pads. Almost every pair of my shoes have them. OMG the GUCCI heels were at DSW? Thank you for the amazing info! :) I loove the booties! Love these!! I was curious what BR boots you got when you tweeted about the great deal last month. I saw those at my local store (in size 9 only) and was very sad they didn't have smaller sizes. I also eye the gucci shoes on DSW but they don't seem to have sizes smaller than a 6. Did you get these in the DSW store or on their site? And what size is that may I ask, compared to your AT pumps? I didn't know that DSW carried designer shoes?! My friend actually purchased the same Coach rainboots on Ebay and she loves them! She gets compliments all the time about them. My favorite out of the bunch are the coral Gucci ones, they will add a nice flavorful punch to your outfit I'm sure! @Vicky LOL :) Thanks for the recommendation. I was thinking about the same thing. The sold pads definitely help prevent slipping. @April, @Banhannas, @curls-and-pearls Yes, DSW started to carry designer shoes not too long ago. They are also available online but the selection is very limited. My favorite would be the Gucci ones, the color is fun but not too bright. I am sure you will be able to use them for several occasions. I have been into the shoes shopping mode myself and tried to buy various color other than basic black. The rainboots are ADORABLE! So fun for skipping through puddles. : ) I've been looking at the Dav City ones too - mainly for the heels. Haven't had any luck with actually locating a pair though. The BR booties are really sophisticated and suit your style very well! ohhhh i love the gucci pumps! they are so chic and classic. i'm sure you'll get so much wear out of them. can't wait to see them on you. I love shoes posts, and these are all excellent purchases! I really love bright, colorful rain boots, and these definitley fit the bill! You got such an amaing deal on the Gucci pumps, they are beautiful! I'm so happy you've found a pair of rainboots you love! The print is so fun and bright. It would brighten me up instantly on a rainy day :) The leather looks so soft and scrumptious on the pumps and booties. Can not wait to see modeling pics! I love shoes too! The rainboots are so cute and cheerful. I'd love to see what you wear the gucci pumps with, they have a real retro vibe to them and are so on trend for right now. The BR booties are very classic and will look timeless for years to come. They remind me of the ones from JCrew a couple of seasons ago....can't remember if they were suede or leather. I love love all three! Okay, I'm a high-heel kinda girl so Gucci and BR does it for me! Great finds! I especially love the color of your Gucci heals! So spring!! Can't wait to see you use them in future outfits! What fabulous finds! I REALLY want to see modeling pics of the boots bc they look like such a fun and cheerful pop of color! Love all these!!! Esp. the Gucci pair is fab!!! omg i'm in love with all of your new shoes!! the rainboots are so fun and it actually makes me wish that it rained more here so i could buy myself a pair. and how amazing that you were able to find Gucci pumps for $99?!! and those BR booties look so lovely. the color is perfect. i can't wait to see you wearing these shoes! 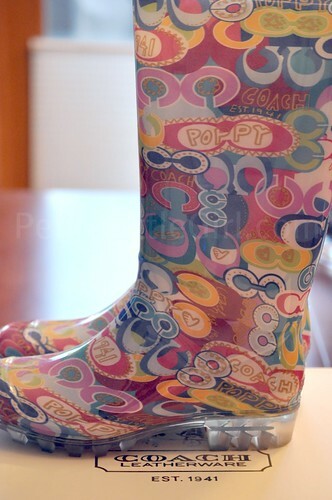 Love the Coach rain boots! Loved the rain boots!! Makes you wish for rainy days esp weekends!! Excellent color for the booties too.